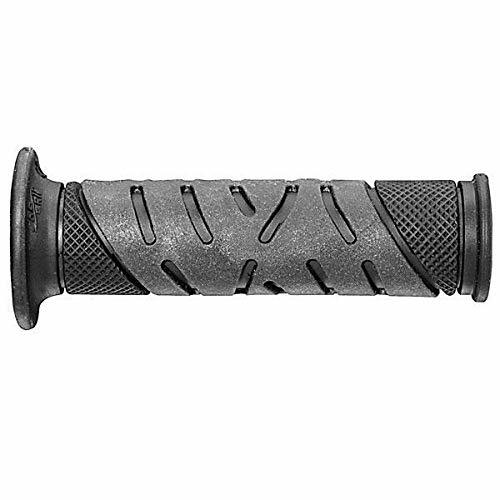 Innovative GP Gel Provides the Best Grip in All Weather Conditions.Absorbs Vibration Transmitted by Both the Motor and the Conditions of the Road Itself.Available in Three Designs.These Are CLOSED-ENDED Grips.Fits 7/8 Inch Handlebars Which Is Common on Almost Every Sportbike, Dirtbike, ATV and PWC.Sold in Pairs.Please Note: The Image Displayed Is Representative of the Item, but May Vary Slightly Depending on Your Specific Model. 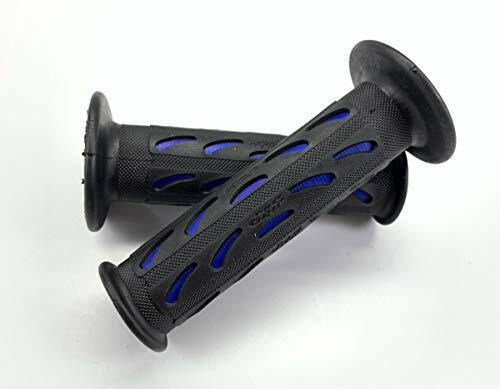 These grips are made by two different density rubber materials. 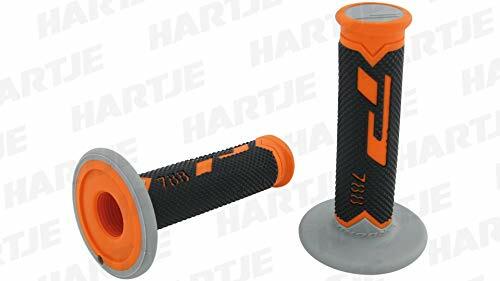 This is what riders are looking for: hard material in the inner part of the grip to fix better on the bar without any problem of slippery and soft material for reduction of all vibrations that the motorcycle can transmit. Comfort and technology for your hands. 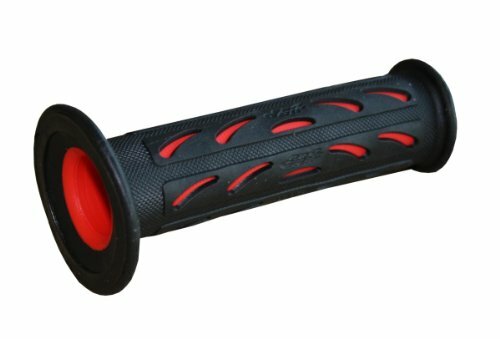 Reduced vibration gel system. Conforming gel in contact. 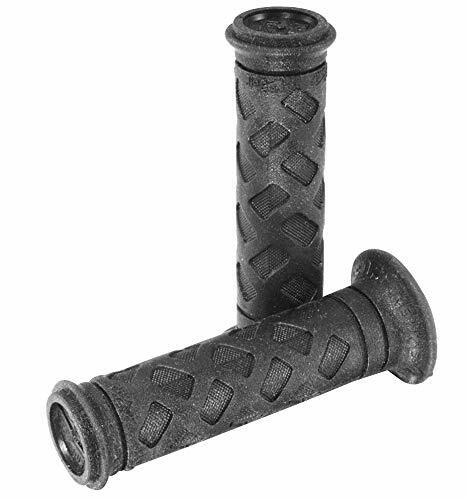 Dual compound area with durable gomma base. The ultimate in performance and comfort. Open ends; wire tie grooves. Deep grooves wrap around the gripping area. Comes with black/gray color. 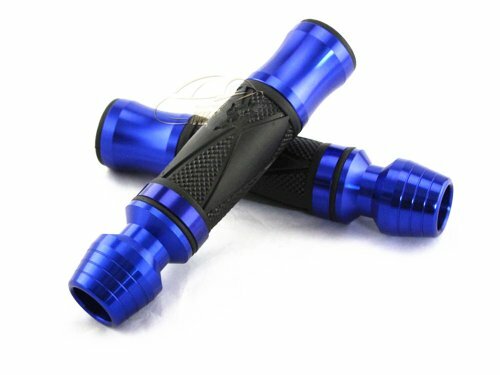 Measures 22-25mm inside diameter by 125mm length. Special GEL Compound Reduces Vibration.125mm.These Are CLOSED-ENDED Grips.Fits 7/8 Inch Handlebars Which Is Common on Almost Every Sportbike, Dirtbike, ATV and PWC.Sold in Pairs.Please Note: The Image Displayed Is Representative of the Item, but May Vary Slightly Depending on Your Specific Model. 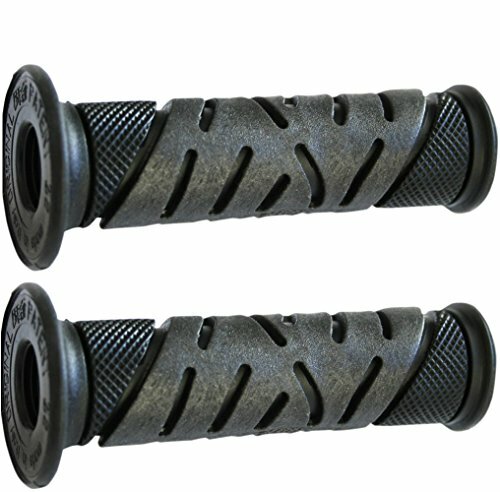 Special GEL Compound Reduces Vibration.125mm.These Are OPEN-ENDED Grips.Fits 7/8 Inch Handlebars Which Is Common on Almost Every Sportbike, Dirtbike, ATV and PWC.Sold in Pairs.Please Note: The Image Displayed Is Representative of the Item, but May Vary Slightly Depending on Your Specific Model. 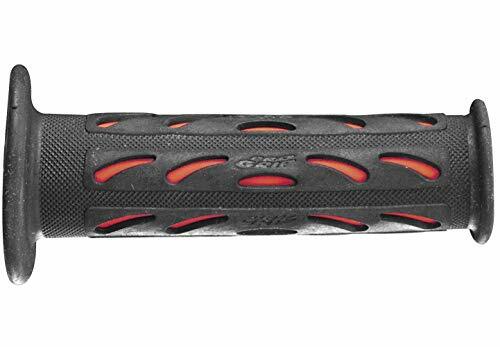 This special soft dual density superbike grip is designed for both style and comfort. 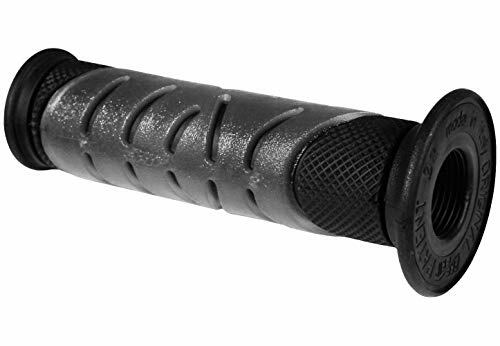 Features a reduced vibration Gel System, open end design and deep grooves for secure gripping. 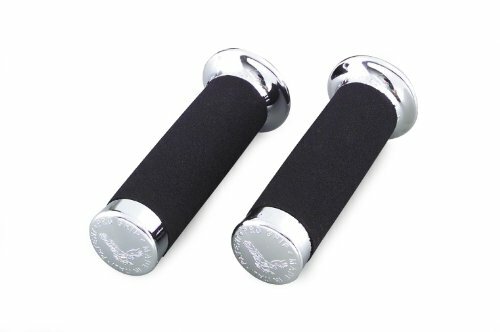 Hard Density Against the Bar to Decrease Twisting and Movement on the Bar. 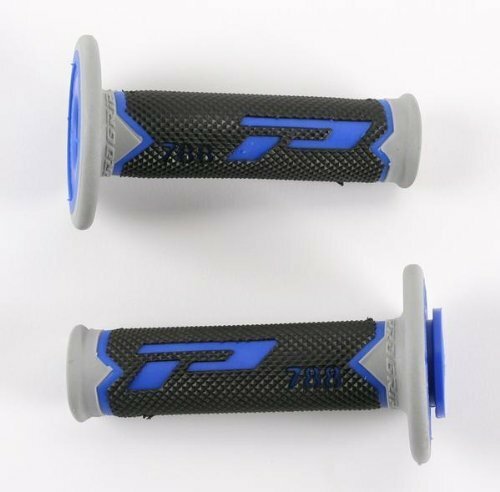 Medium and Soft Density in the Grip and Palm Area for Added Comfort and Reduced Vibration.An Even Stronger Inner Sleeve to Help Minimize Grip Movement, While Providing Both a Soft Gel Material and a Harder Material Where Needed.These Are CLOSED-ENDED Grips.Fits 7/8 Inch Handlebars Which Is Common on Almost Every Sportbike, Dirtbike, ATV and PWC.Sold in Pairs.Please Note: The Image Displayed Is Representative of the Item, but May Vary Slightly Depending on Your Specific Model. Special designed GELS. Closed end. 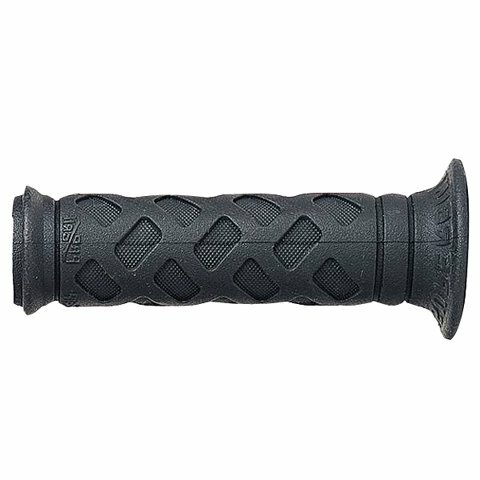 Length: 122 mm. 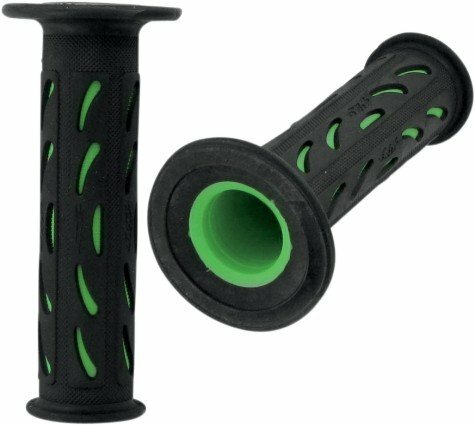 Pro Grip 724 Dual Density Sportbike Grips Black/Green 7/8"
Designed for Vibration Dampening.130mm.Black.These Are CLOSED-ENDED Grips.Fits 7/8 Inch Handlebars Which Is Common on Almost Every Sportbike, Dirtbike, ATV and PWC.Sold in Pairs.Please Note: The Image Displayed Is Representative of the Item, but May Vary Slightly Depending on Your Specific Model. 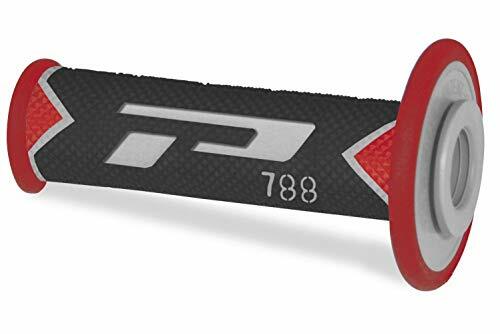 Open end for sportbike bar-end weights. Used by World Champion Troy Corser. 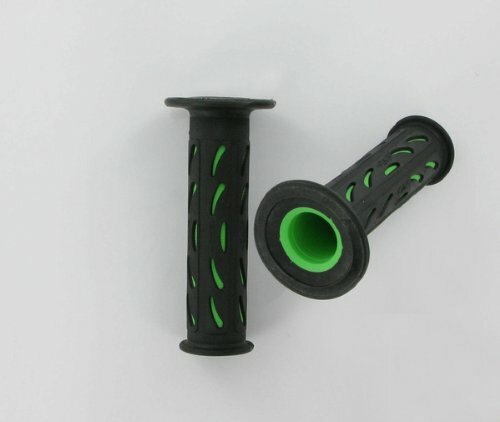 Length: 125 mm. 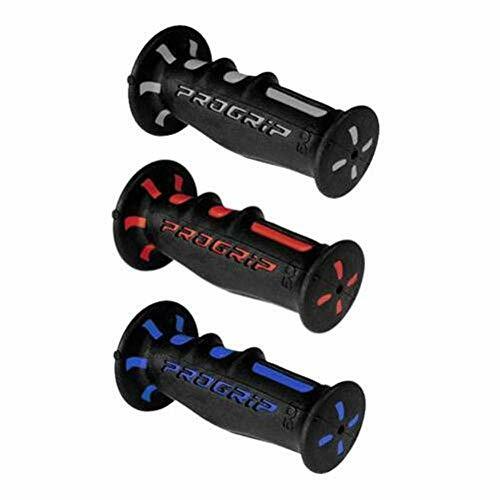 Sleek New Tread Pattern Design in Proprietary ProGrip DuoDensity GONT Racing Compound.50 Shore Harder Compound on Inside of Grip for Better Grip on the Bar, 37 Shore Softer Compound Towards Hands.ProGrip's Reduced Vibration Gel Absorbs Shock and Vibration Better and Gives You Reduced Fatigue and Better Control.120mm.These Are CLOSED-ENDED Grips.Fits 7/8 Inch Handlebars Which Is Common on Almost Every Sportbike, Dirtbike, ATV and PWC.Sold in Pairs.Please Note: The Image Displayed Is Representative of the Item, but May Vary Slightly Depending on Your Specific Model.